Q. HOW DOES THE PALEO DIET WORK? A. With readily available modern foods, The Paleo Diet mimics the types of foods every single person on the planet ate prior to the Agricultural Revolution (a mere 333 generations ago). These foods (fresh fruits, vegetables, meats, and seafood) are high in the beneficial nutrients (soluble fiber, antioxidant vitamins, phytochemicals, omega-3 and monounsaturated fats, and low-glycemic carbohydrates) that promote good health and are low in the foods and nutrients (refined sugars and grains, trans fats, salt, high-glycemic carbohydrates, and processed foods) that frequently may cause weight gain, cardiovascular disease, diabetes, and numerous other health problems. The Paleo Diet encourages dieters to replace dairy and grain products with fresh fruits and vegetables – foods that are more nutritious than whole grains or dairy products. Q. HOW IS THE PALEO DIET DIFFERENT? A. The Paleo Diet is the unique diet to which our species is genetically adapted. This program of eating was not designed by diet doctors, faddists, or nutritionists, but rather by Mother Nature’s wisdom acting through evolution and natural selection. The Paleo Diet is based upon extensive scientific research examining the types and quantities of foods our hunter-gatherer ancestors ate. The foundation of The Paleo Diet is meat, seafood, and unlimited consumption of fresh fruits and veggies. Q. 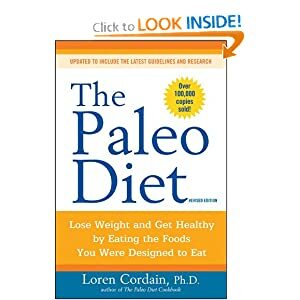 HOW CAN THE MEAT AND SEAFOOD-DOMINATED PALEO DIET HELP ME LOSE WEIGHT COMPARED TO A HIGH- CARBOHYDRATE, LOW-FAT DIET? A. Conventional wisdom tells us that to lose weight we must burn more calories than we take in and that the best way to accomplish this is to eat a plant-dominated, low-fat, high-carbohydrate diet. The first part of this equation is still true – a net caloric deficit must occur in order for weight to be lost. However, the experience for most people on low-calorie, high-carbohydrate diets is unpleasant. They are hungry all the time, and for the vast majority, any weight lost is regained rapidly or within a few months of the initial loss. There is an alternative – a diet that emulates what our hunter-gatherer ancestors ate – a high-protein, high-fruit and veggie diet with moderate to higher amounts of fat, but with increased quantities of healthful omega-3 and monounsaturated fats. Protein has two to three times the thermic effect of either fat or carbohydrate, meaning that it revs up your metabolism, speeding weight loss. Additionally, protein has a much greater satiety value than either fat or carbohydrate, so it puts the brakes on your appetite. Finally, numerous recent clinical trials have shown high-protein, low-glycemic load diets to be more effective than low-fat, high-carbohydrate diets in promoting weight loss and keeping it off. Q. WHAT ARE OTHER HEALTH BENEFITS THAT MAY OCCUR WITH THE PALEO DIET? A. The carbohydrates (unlimited fruits and veggies) in The Paleo Diet are of a low-glycemic index, meaning that they cause slow and limited rises in your blood sugar and insulin levels. Excessive insulin and blood sugar levels are known to promote a cluster of diseases called the Metabolic Syndrome (obesity, hypertension, undesirable blood cholesterol and other blood lipid levels, Type 2 diabetes and gout). The high fiber, protein, and omega-3 fat content of The Paleo Diet will also help to prevent the Metabolic Syndrome. Q. ON THE PALEO DIET, HOW WILL I GET ENOUGH CALCIUM FOR STRONG BONES WITHOUT CONSUMING DAIRY? A. In the U.S., calcium intake is one of the highest in the world. Yet paradoxically, we also have one of the highest rates of bone de-mineralization (osteoporosis). Bone mineral content is dependent not just upon calcium intake but upon net calcium balance (calcium intake minus calcium excretion). Most nutritionists focus upon the calcium intake side of the calcium balance equation, however few realize that the calcium excretion side of the equation is just as important. The Paleo Diet recommends an appropriate balance of acidic and basic (alkaline) foods (i.e., grass produced or free ranging meats, fish and seafood, fruits, and vegetables) and will not cause osteoporosis in otherwise healthy individuals. Indeed, The Paleo Diet promotes bone health. Q. WHY SHOULD I AVOID ADDING SALT TO MY FOOD? A. As do hard cheeses, cereal grains, meats, and legumes, salt presents a net acid load to the kidneys in the absence of alkaline foods such as fruits and vegetables. The body responds by tapping its reserve of calcium salts in the bones, which can lead to osteoporosis and other degenerative diseases. As described in The Paleo Diet, cheeses, grains, and legumes are nutritionally problematic for other reasons as well. Eating fresh, non-processed meat is fine when it’s balanced with fruits and veggies. Do your body a favor and put the salt shaker away. Q. DOESN’T THE MEAT-BASED DIET OF OUR STONE AGE ANCESTORS PROMOTE HIGH CHOLESTEROL AND HEART DISEASE? A. There is no doubt that the fat quality and quantity in the wild animals our Stone Age ancestors ate was vastly different from the types and quantity of fat found in feedlot-produced meats. A 100-gram serving of roast buffalo contains only 2.4 grams of fat, and 0.9 g of saturated fat, whereas a 100-gram, T-bone beefsteak contains a whopping 23 grams of fat, and 9 grams of saturated fat. Additionally, the bison roast contains 215 mg of heart-healthy, omega-3 fatty acids, whereas the T-bone steak contains a paltry 46 mg. Despite its blood cholesterol raising effects, recent meta analyses (combined, large population studies) show that saturated fats have little adverse effect upon the risk for heart disease. We recommend that you should choose free-ranging or grass-produced meats over feedlot meats whenever possible. These meats are more healthful because they have nutritional characteristics similar to wild animals. Recent clinical studies have shown that high-protein diets are more effective in improving blood cholesterol and other blood lipid levels than are low-fat, high-carbohydrate diets. High-protein diets have also been shown to lower blood homocysteine levels, another risk factor for heart disease. Q. AREN’T WHOLE GRAINS GOOD SOURCES OF FIBER, MINERALS, AND B VITAMINS? HOW CAN I GET THESE NUTRIENTS IF I CUT DOWN OR ELIMINATE GRAINS FROM MY DIET? A. On a calorie-by-calorie basis, whole grains are lousy sources of fiber, minerals, and B vitamins when compared to the grass produced or free ranging meats, seafood, and fresh fruit and veggies that dominate The Paleo Diet. For example, a 1,000-calorie serving of fresh fruits and vegetables has between two and seven times as much fiber as does a comparable serving of whole grains. In fruits and veggies most of the fiber is heart-healthy, soluble fiber that lowers cholesterol levels – the same cannot be said for the insoluble fiber that is predominant in most whole grains. A 1,000-calorie serving of whole grain cereal contains 15 times less calcium, three times less magnesium, 12 times less potassium, six times less iron, and two times less copper than a comparable serving of fresh vegetables. Moreover, whole grains contain a substance called phytate that almost entirely prevents the absorption of any calcium, iron, or zinc that is found in whole grains, whereas the type of iron, zinc, and copper found in grass produced or free ranging meats and seafood is in a form that is highly absorbed. Compared to fruits and veggies, cereal grains are B-vitamin lightweights. An average 1,000 calorie serving of mixed vegetables contains 19 times more folate, five times more vitamin B6, six times more vitamin B2 and two times more vitamin B1 than a comparable serving of eight mixed whole grains. On a calorie-by-calorie basis, the niacin content of lean meat and seafood is four times greater than that found in whole grains. Q. CAN I USE THE PALEO DIET AS A VEGETARIAN? Most vegans and vegetarians rely upon legumes (beans, soy, lentils, peas, etc.) and whole grains to meet the majority of their daily caloric intake. Legumes and whole grains contain some of the highest concentrations of antinutrients in any foods. These compounds frequently increase intestinal permeability and cause a condition known as “leaky gut,” a necessary first step in almost all autoimmune diseases. Further, a leaky gut likely underlies chronic, low-grade inflammation, which underlies not only autoimmune diseases, but also heart disease and cancer. Further vegan and vegetarian diets almost invariably result in numerous vitamin, mineral and nutrient deficiencies such as B12, B6, D, zinc, iron, iodine, taurine and omega-3 fatty acids. So, to answer your question, it is simply impossible to follow a Paleo Diet without animal food (meat, seafood and eggs).